Tonight I have the first of my new lot of Brian’s Fridays, and with this in mind I have been keeping half an eye open for cheap, cheerful chairs. In the course of which process I recently discovered a new use for digital photography. I am fond of joking that my digital camera, especially the latest one with its super-zoom lens, has better eyesight than I do, but this is more than a joke, which is why it is, I think, quite a good joke. It’s true. So there I was in Tottenham Court Road looking through the window of a shop, long after it had closed, and observing from a distance a chair that looked pretty cheap to start with and had been reduced from … £something, to £something-even-less. From what? Even if I had more up-to-date glasses I probably couldn’t have made it out. And more to the point to what? Those vital numerals were quite big, but unclear. Still too much, I think. But good to know, in real time. I’m still a bit hazy about how to do that click-and-enlarge thing here at New Samizdata, but trust me, on the original I could also see that it was reduced from £90. Sam Bowman, my speaker for the evening, has just arrived, and I told him about this posting. Yes, he said, a little telescope in your pocket. Exactly so. One of the many uncertainties about the future generally (such as the portentous banking uncertainties that Sam Bowman will be speaking about) and about the applications that people will find for new technology in particular is that you often can’t tell beforehand what rather surprising applications people will find for new technology. Digital photography costs more than nothing, quite a lot more than nothing if you really like it, but its marginal cost, the cost of the next photo, really is, pretty much, nothing. That means a world full of hard discs full of photo-crap. But it also means that if you have digital photography on you, you will find further genuinely useful uses for it, the way you never would for photography done with shops or dark rooms. I have long used my camera to photograph signs, next to tourist attractions or to paintings in galleries. I even choose to speculate that in the age of digital photography such signs may well have become more elaborate, long-winded and informative. I routinely photo local maps while on my photographic wanderings, so that I later know where everything was, even years later. But I have never before used my camera actually to see something very trivial, very boring to anyone else, right then, right there. The boringness and the triviality being the point. Capitalism doesn’t just do big stuff, like: digital photography! It does the little things, like telling you the price of a chair which is too far away for you to be able to read the label. And, you never know what other boring and trivial things it might be able to do for you in the future. I demand that legislation be introduced that required all store with good on display (ie. visible in any form from a publicly accessible area) after hours put a full list of prices in their window, including “before” prices for any reduced goods. We cannot allow participation in society to be predicated on owning an expensive and foreign-made camera. The degree of inequality and oppression this would lead to is just staggering. I’m used to seeing video directors doing their “recce” and using thumbs and forefingers of their two hands to make a “frame” through which to view and to plan their intended shots. Lately they are all using their iPhones for the purpose. I suppose it is self evident, using a camera as a stand-in for a camera. But it is a change in practice that I noticed. 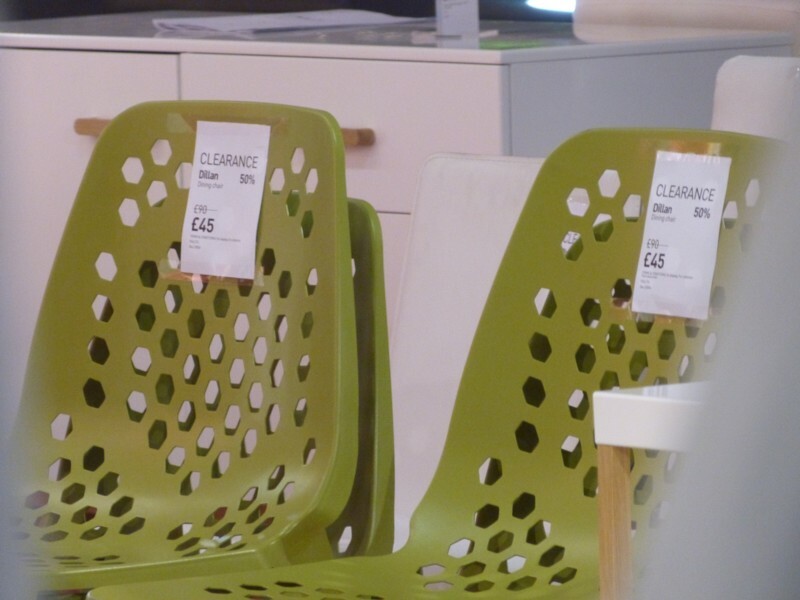 Is that 45 pounds for four chairs? That’s something like 71 dollars. It’s bad enough that they are avocado green (the official co-color, along with mustard brown, of the 1970s), but 71 bucks for four exceptionally ugly plastic chairs is just mind-boggling. It gets worst if that is the price per chair. OK, now I want to see what did you end up buying. In 2009 I was wandering around museums in Italy and noticed that in modern museums with their primary focus being preservation of the original, I was often able to get a brighter and clearer view of the artwork through the LCD on my Lumix DMC-LX3 than with my Mark One Eyeballs. Erm… how about cushions and sitting on the floor Brian? I’m sixty but can still manage crossed legs. As to the camera, it is bloody marvelous folks, thoroughly enjoying ours. I looked all around and I noticed there wasn’t a chair. Ted, Norwegian Wood… and I claim my ten pounds. Pah! You obviously know nothing of recent trends in interior decor. The 70’s generally and avocado specifically is right bang on trend at the moment, riding a wave of nostalgia from kids of the sixties. Hell, I like avocado! And beige! It’s black electronic gadgets with tiny ‘silver’ (read: ‘dim gray’) labels on the controls that are the true Abomination! I should add that the rear view of a naked fat man sitting in one of those chairs would be, um, unedifying. Brian, you appear to have posted the picture with the click and enlarge thing working just fine. -electrical breaker panels to analyze circuit layouts. -contracts in a lawyers office, rather than taking notes. -licence plates and VIN numbers. -ad hoc engineering and construction detail sketches rather than asking the engineer to scan and email them. -poor construction work, good construction work, construction detail generally. -clean apartments, dirty and damaged apartments. -a persistent trespasser with a crapping dog. The judge was amused. It has become my most important tool.